I had two weeks between my trial day and official first day at Chez Panisse. It was awesome to be back in the kitchen after a brief hiatus, and it was what I remembered and more. I started out my second day at 7:30 in the morning, the earliest I can remember waking up since Brendon and I flew to Minnesota to see his family in early December. I will have to get used to it, though I am genuinely happy that I am waking up to do something I am passionate about and enjoy…who else gets to say that? (My mother does). My first task with the other pastry intern I was shadowing was to slice apples for the galette of the day which made with pink lady apples and prunes. The culinary artist sarah gave her own unique spin on the design and it reminded me in that moment that food is art. After finishing the apples, we supremed and segmented blood oranges. Before we cut them all we always taste one first, giving it too the shift leader. The oranges were rather bitter so we soaked them in some caramelized blood orange juice to make them a bit sweeter. Supreming citrus is when you take off the peel of the fruit with the knife, and segmenting is cutting out each individual segment of the orange. The pros at Panisse make it looks very simple, but capturing a perfect sphere is a difficult task…I am sure I will be supreming often and will eventually get the hang of it. It was then time to get the prunes, deseed them, and roughly chop them for the base of the tarts. It was an easy task and we completed it in minutes. Next I was set to cut up Brittle for the topping of one of the desserts, I was absorbing so much information at this point that I have no idea which dessert it was to crumble upon. As I was chopping away, a film crew from some Eastern European country entered and began to film me chopping the brittle. I surely hadn’t asked to be filmed, but I kept silent and stuck to my task…eventually they left me alone. I am sure I will have to get used to cameras working in such a famous kitchen. At about 11:30 we bring down one of each dessert to taste so that adjustments can be made to them before lunch begins. I kept quiet, I am interested in their expressions and the way each pastry chef connects with the food. Nothing is changed, and everything is impeccable. 20 cored apples, and a lot of small talk later it was time for the best part of the day. Lunch. I ate a little of everything, chomping my way through food specifically made for the “family”. I made myself an espresso and sat outside on the steps with the other people in pastry enjoying and remembering my slice of heaven. It behoves you to eat quickly at Chez Panisse, as there is a lot of work to get done. I am finished within 20 minutes and resume my various projects. An hour or so later, Carrie, the head pastry chef walks in and begins checking in with her staff. It is like a wave of calm, her demeanor and smile show she is passionate and sincere. It is a breath of fresh air as my shift is a couple hours away from being over. Then it was time for the dreadful eggs, the task that took me an hour and a half the first day. I was immeasurably better and was able to use the shell to finished in no time at all. Whew, I am getting the hang of this all I thought to myself. Except…has anyone ever used kumquats? Sure we all know what they are but they have very little meat inside, and loads of seeds. My task was to cut them thinly deseeding as I went. 4 cups turned out to be what seemed the longest project of the day, and by the end my fingers burned with the acidic juice. I was ready to wash my hands of the project and end the day. I am exhausted but excited to get up even earlier tomorrow and practice more technique. Until then, here is a simple recipe inspired by Chez Panisse. 1. Heat the oven to 350 degrees Fahrenheit. 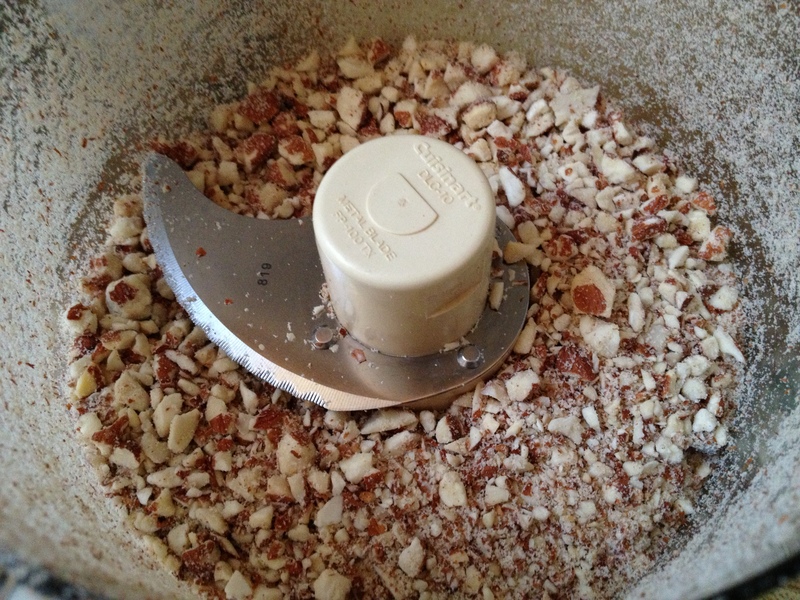 Chop the almonds up in to small pieces, this can be done with a lot of knife work, or in a food processor, just take care to not process too much otherwise you will end up with nut butter. Then place them in the oven on a baking tray with some parchment paper. 2. Pour the sugar and cream of tartar of lemon juice into a saute pan and heat over medium heat. Watch the sugar, do not stir. A hot spot will occur where the sugar will begin to turn dark. 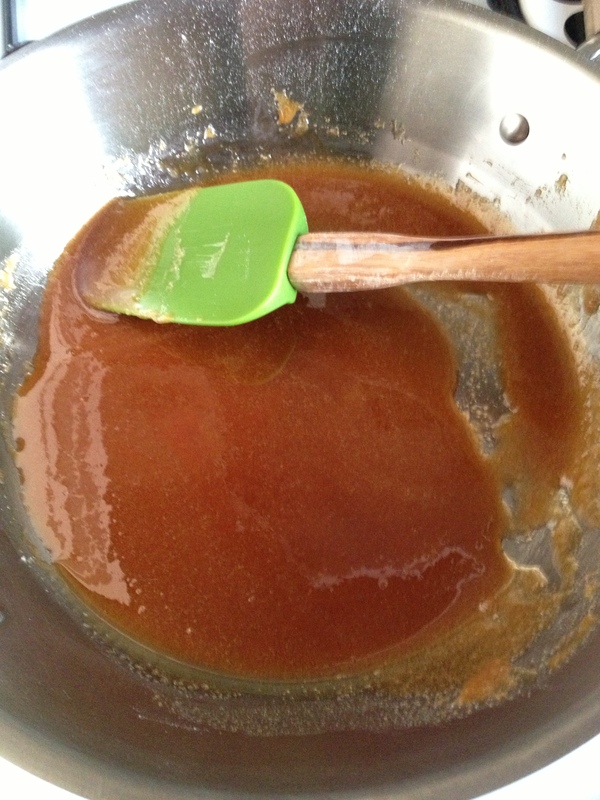 Wait until the sugar becomes dark like caramel and begin to stir the sugar until there is no more granulations. After all syrup is a liquid and easy to work with, turn off the heat and stir until all the granulations disappear. 3. 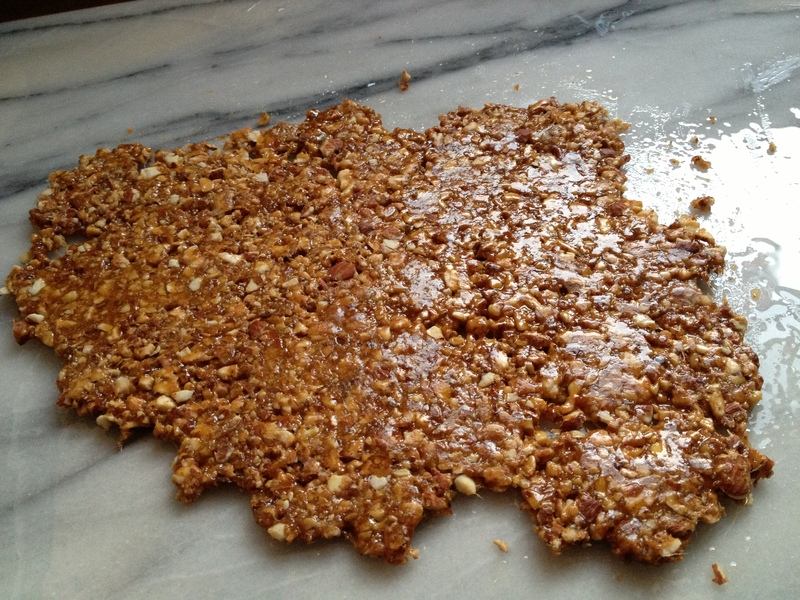 Stir in the almonds and work quickly to incorporate the almonds into the syrup. 4. 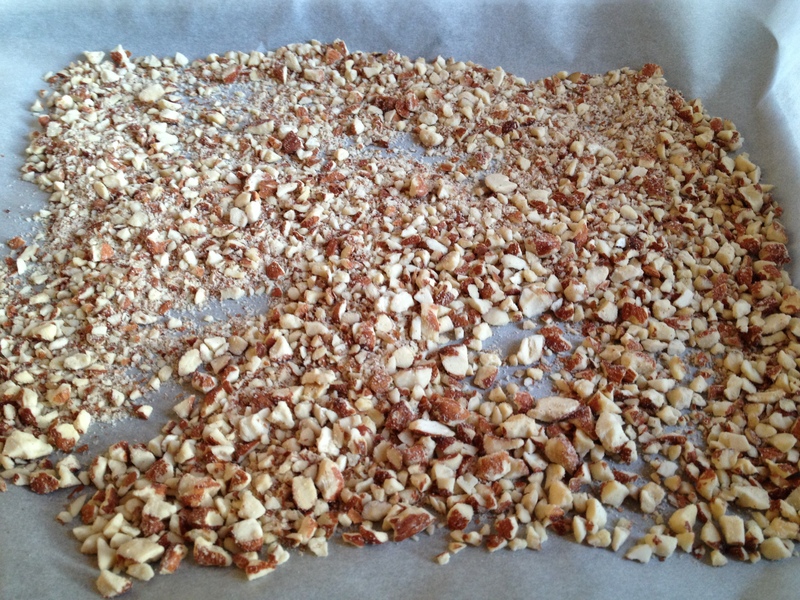 Dump out the almonds on a well oiled counter or oiled marble slab, making sure to use a well oiled rolling pin. Roll quickly until thin as they will dry and cool in no time. Enjoy these after they are rolled, they are an easy and delicious dessert to entertain your guests…or your evening appetite!